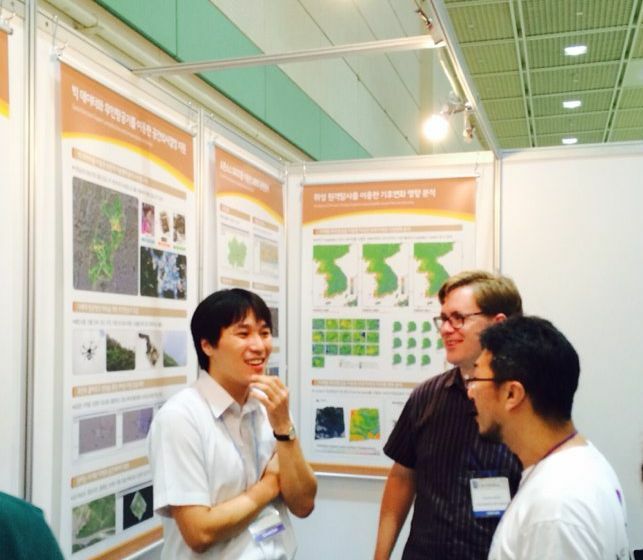 Today I’ll highlight the work of Mr. Byeong-Hyeok Yu, one of two GIS people at Korea National Park Service (KNPS). The other GIS person is (if memory serves) in the research branch of that institution. I’ll highlight a few of Mr. Yu’s projects. To start with, we have the classic natural resource management projects — you remember — those analyses that you did in your college GIS programs that were the promise of what was to come, what you were to do in a career of GIS? Ya. He gets to do those for his real job. In fairness, based on all he does, I suspect he doesn’t sleep many hours each night. What else though — that is what you’d hope a parks GIS guy would do. Mr. Yu has piloted KNPS’s drone program, flying a variety of sites which require high resolution aerial imagery with 8 rotor UAS’s. few square miles. It’s really refreshing to see KNPS leading the way in this category. There are just two more projects I want to touch on. The first, like drones, is address the question of how do we, as managers of parks, steward high resolution info, in this case both for operations and park users. To this end, Mr. Yu has a small army of park rangers wandering around with backpack camera units mapping out trail view (like streetview) imagery for Naver Daum, (one of Korea’s Google equivalents). I like projects like this, as they leverage existing work within the organization (a small army of park rangers hiking the trails of KNPS and interacting with and helping visitors), and external partnership, in this case Naver to achieve an exceedingly useful product that has the following benefits: documentation of the state KNPS trail system (these data become historical some day), addresses recreational needs and questions of the public, and likely aids in operational and planning questions that would be difficult to address otherwise. (As a side note, for application in the US, I’d be interested in the licensing of the resultant data — I’m an advocate of such data being as liberally licensed as possible, something difficult to accomplish with some of our native tech giants). This app serves two purposes. The first is that engagement piece I reference above — the app is an exercise in how to use the smart phone as a platform for engaging, educating, and making comfortable park users. The second purpose is simple. The app becomes a tool for connecting injured hikers with rescue personnel. To this end, it has already been used twice. So. Is this public sector GIS as you think of it? Bravo Mr. Yu. For the record, Mr. Byeong-Hyeok Yu has been in his position 3 Years. Interesting article! A tiny odd bit is that the trail view screenshot is actually an image from Daum, another major Korean portal competing with Naver. I’d guess you meant to show an example like this Naver streetview of Gyeryongsan National Park: http://j.mp/1v2HV1S Meanwhile, it seems the national park uses Daum for mapping trails on their website, but found no streetview like imagery there. Good point on my confusion of Daum and Naver. I believe the collaboration is with Daum. I don’t know the release status of the data, just that the data collection is underway. Maybe Mr. Yu can weigh in comment. Thank you, Stephen! We have a good relationship with both Naver and Daum Corp. Naver did the trail survey by themselves. In the Daum case, we did the trail survey and then Daum is making the 3D map nowadays. The survice will be released by Oct. 17th.